The Taming of the Glue: Winter Flowers ...2nd Installment! Good Morning All and a very Happy Tuesday! I'm really enjoying using the Winter Flowers set of stamps from Creative Expressions and thought I'd show you a card today made with the Crocus stamp. It's nice to think that Spring will be here eventually! Stamp the Crocus onto Coconut White Cardstock with Black Archival Ink allowing enough room to die cut later. Stamp the Crocus again onto a Post-it note with as much on the sticky strip as possible. Cut out just inside the black line. Using the cut out as a mask, cover over the stamped Crocus and stamp again to the left of it, then to the right. Stamp slightly higher than the original one. Paint the leaves with Shabby Shutters and Peeled Paint Distress Inks. Paint the flowers using Milled Lavender, Dusty Concord and Chipped Sapphire Distress Inks. Cover with Creative Expressions Double Sided Adhesive and die cut with Spellbinders Labels 28. Take off the backing sheet and apply Micro Beads. Draw around the outer edge of the die on Dark Roast Coffee Cardstock and cut out to make a matt slightly larger than the previous one. Using the Creative Expressions A4 Basket Weave Embossing Folder, dry emboss a piece of Coconut White Cardstock. Stamp the word "Crocus" onto a strip of card with Dusty Concord Distress Ink. Lightly distress the edges with the same ink. Matt and layer onto a piece of the Coffee Card. Tie a triple bow with Purple Seam Binding, spritz it with water and scrumple up. Dry with a heat gun. Mount the Crocus picture onto the card with 3d foam pads. Attach the bow with a glue dot. Stamp "With Love" onto Coconut white card using Dusty Concord Ink and die cut with Labels 28. With the die still in place, distress with the same ink. Draw around the outer edge of the die onto the Coffee card and cut out to make a matt. Curve the tag and attach to the card using Cosmic Shimmer Dries Clear Glue and a 3d foam pad. Add a Dazzler to the centre of the bow to finish. I do wish that I had screen that allowed you to touch the picture so that you could get the full effect of the Micro Beads! Well, that's all for today. I'll be back again next Tuesday with another project using the Winter Flowers. 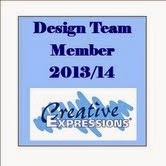 Until then, do pop over to the Creative Expressions blog so that you can see what the other members of the Design Team are up to! Also, Just 12 more followers before I draw for the blog candy! Until next time, have a happy crafty week! Love the colors! I need to drag out my microbeads and post-it-notes!